With a pair (2) of mobile column lifts, you can add to your existing fleet and expand your lifting capabilities to include larger semi-trucks and heavy-duty vehicles. 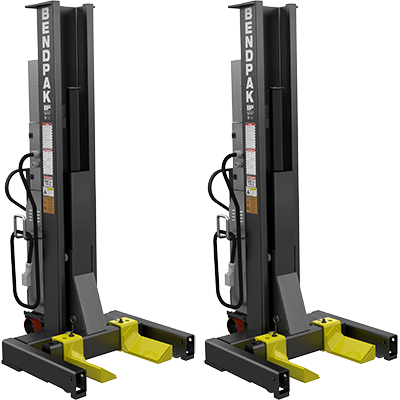 A minimum of 4 mobile column lifts must be used to lift a vehicle, and heavier vehicles require 6 or 8. This 2-set is a great way to gradually upgrade into the 6 or 8-lift range, offering up to 65,317-kg. with a full set. Do not attempt to lift half of a vehicle (the front or back only) with only 2 mobile lifts. Vehicles must be raised on an even plane at all times.